Leading Manufacturer of pre engineered buildings exhaust ventilators from Chennai. We are offering Exhaust Ventilators for Pre Engineered Buildings which specializes in designing, manufacturing and installing roof ventilation systems, exhaust ventilation systems and commercial prefabricated structures for residential, commercial and industrial projects. A brushless, electronic, commuting motor which provides excellent reliability and an anticipated operational life well in excess of five years. Motor replacement is a simple task. Performance is dependent of the wind speed, unlike rotary vents. Very economical operation with anticipated annual energy costless. No electrician required if a power point is available within roof cavity. 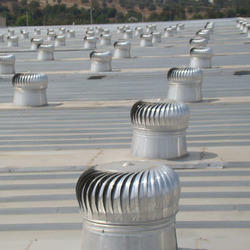 Installation on any roof type and slope up to 45^0. One exhaust ventilator can provide adequate ventilation for a 20 square meter (180^2) home. Room Temperatures: Upto 50^0 C.
Looking for Exhaust Ventilators for Pre Engineered Buildings ?